Earlier today, we told you a few interesting things about the HQ live trivia game show that is now drawing 1 million contestants and more twice each weekday, and once a day on Saturday and Sunday. We told you that subscribers to the app cannot cash out unless they have $20 or more in winnings sitting in their account. Considering that winners take in anywhere from $6 to $75 depending on a particular game's jackpot and the number of winners splitting the prize, you might have to be a multiple winner to actually receive your winnings. The average take for one show is $10-$20 for each winner. Well, the good news is that HQ has pushed out an update to the app today, and has also removed some restrictions. No longer do you need at least $20 in cash in order to enjoy the fruits of your HQ addiction. Now, there is no minimum balance required, and any amount of winnings in your HQ account can be transferred to your PayPal account. We must confess that we heard this directly from HQ's quizmeister Scott Rogowsky while partaking in Friday's 3pm game (we were eliminated on Question 4). HQ also posted this on its Twitter site. Another change now allows users with extra lives earned by referring others to the game, to use these lives whenever the player wants to. HQ still needs to invest in raising the quality of its live streaming. 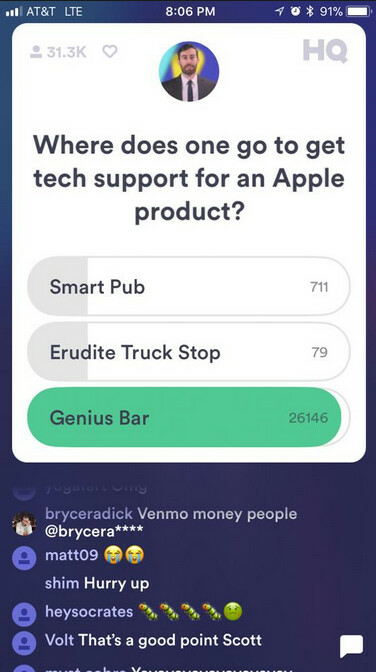 Too many times we almost missed a question because the app froze. And for HQ to continue to grow, it will need to raise the prize level. Yes, we are still in early days for HQ, but soon there will be people dropping out after realizing that for all of that hard work racking their brain, they might not win much more than $10-20. And even if you find HQ to be a fun break in the middle of a tough day, the bottom line is that you are playing the game for one reason and one reason only, and that is to win some money. Here is what we predict will happen. Eventually, HQ will use the ability it has to get in-demand demographics to stare at its streaming content, to sell ads. And that will allow HQ to increase the prize money to the point where winning the game can change a player's life. But that is going to take time. For HQ's sake, let's hope that the American public, not known for having patience, gives the game a chance to get its footings and become the biggest quiz show not just on your phone, but on all screens including television. If you want to play HQ, you can download the free app by clicking on the appropriate link: (iOS|Android).